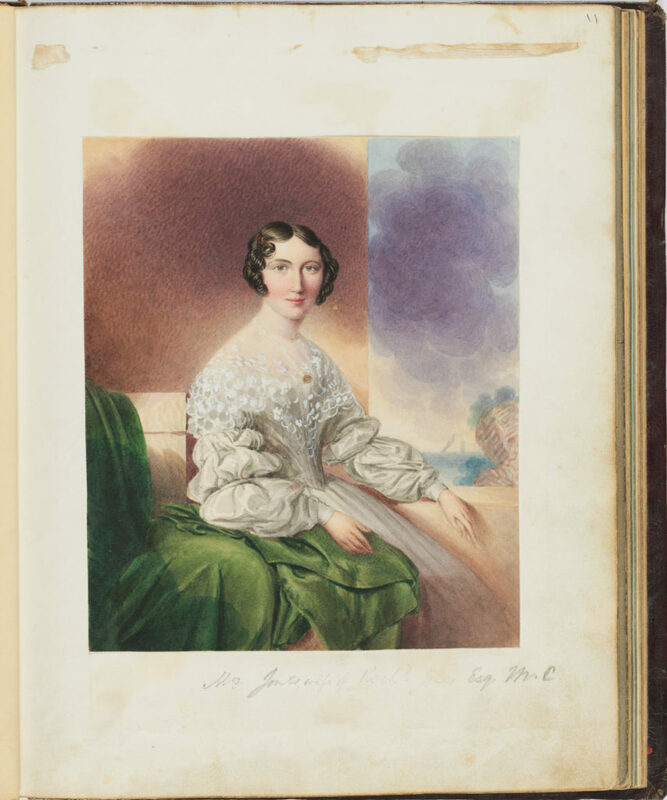 This right facing, seated portrait shows Mary Louisa Jones, aged 34, posed in a domestic setting – perhaps suggestive of ‘Bona Vista’, the Jones’ family villa at Darlinghurst, NSW – with a large swathe of green cloth to the right (her husband, known as ‘China’ Jones, was a successful merchant) and her left arm resting on the ledge of a stone (or rendered) balcony with a view behind past a rocky outcrop to boats on Sydney Harbour. Mrs Jones wears a dinner/evening dress of plain, light-coloured [possibly shot] silk, the neckline cut low off the shoulder and slightly ‘en coeur’ (heart-shaped), above long full bishop’s sleeves set into a short tight sleeve head, and partitioned into sections with narrow bands placed above and below the elbow and confined by slim fitting cuffs at the wrist, below a wide collar, or ‘bertha’, of [blonde, ie. silk] open-worked lace, fastened at centre front with a small square brooch, and spreading over a close-fitting [boned] bodice, covered in drapery folds fanning up over the corsage, above a plain dome-shaped skirt pleated into the pointed waistline. Her dark hair is centre-parted and dressed very low, with a ‘kiss’ curl at the right temple, fastened with clips (or barrettes) above two or three rows of soft curls arranged over the ears. The overall fashionable effect, all through the 1840s, was of pale gentility and demure simplicity. The lines of the silhouette had begun to droop after 1837, turning away from the earlier wide-shouldered, balloon-sleeved styles to become much quieter in tone, forming long pointed angles in keeping with the ‘Gothic’ taste. The lingering presence of voluminous bouffant sleeves in this image, with evidence of the devices employed to rein in their fullness, further supports an early 1840s date. The album in which this image is housed is believed to have been compiled by Richard Jones Jun. (1823-1907) prior to his departure for England in the early 1840s. It includes many contributions from members of the Jones’ family social circle including the Ferriters, who had married into the Jones family, the Cowpers and Stuart Donaldson (business partner of Richard Jones Snr). 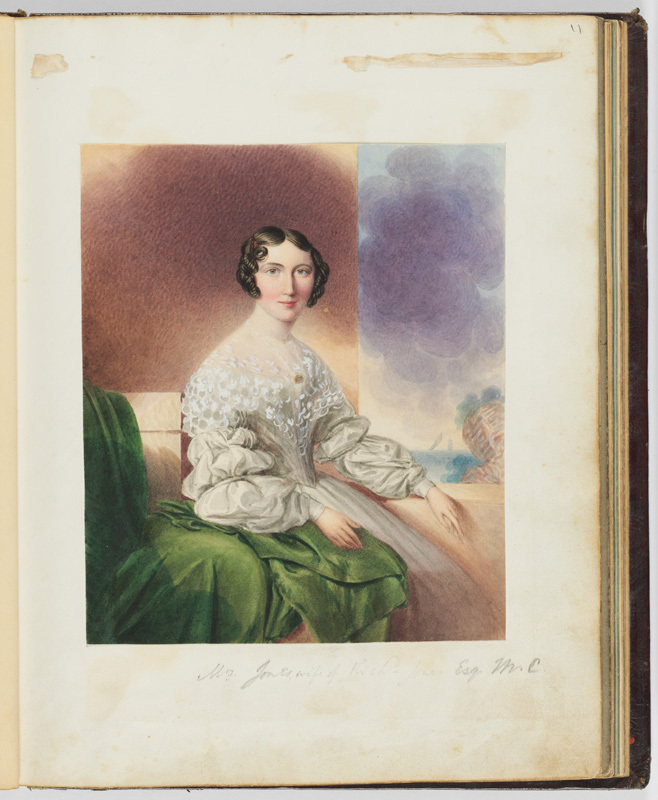 Mary Louisa, nee Peterson (ca.1804 – 1887) married Richard Jones (1786-1852) in England in 1822. The couple arrived at Sydney in 1823, where Jones became a successful merchant and pastoralist. The couple had eight children including Richard Jun. (b. 1822), Mary Australia (b.1825), Louisa (b.1827), Elizabeth (b.1828), Frances (b. 1842) and Thomas (n.d). Subject is posed on a balcony with a view out to Sydney Harbour.